In the 1940s Adolph and Rudolf Dassler had a falling out, Rudolf went on to create Puma (while his brother Adolph went on to create Adidas). Even though Puma was a new company, Rudolf knew a lot about athletic sneakers. Before Rudolf and Adolph Dassler (brothers) went their own ways, they owned Gebruder-Dassler Schuhfabrik a footwear company. To be exact, Puma was established in 1948, and the first shoe to release was the Atom a soccer shoe. Not long after, athletes started wearing Puma’s in key events. In 1952 runner Josef Barthel wore Puma while he won a Olympic Gold Medal in the 1500 m. In 1956, the formstripe was introduced and since then, has been a Puma trademark. It wasn’t till 1968 when Puma brought the now famous “Puma” aka Cat logo to the sneakers and that same year a controversial event took place. Tommie Smith, who won the Olympic Gold 200 m in Mexico was wearing a pair of Puma running shoes. He then took stand barefoot with the Puma’s by his side. At this time, team mate John Carlos and Tommie Smith made the Black Power salute, because of the mistreatment of African Americans at the moment. Mr. Smith then left his pair of Puma’s for the world to see. Later, both Olympians were banned from the Olympics. Other professional athletes to wear Puma are Diego Maradona, a professional soccer player and tennis superstar Boris Becker, which he had his own signature sneaker the “Puma Becker” and “Puma Becker Ace”, releasing in the 1980s. 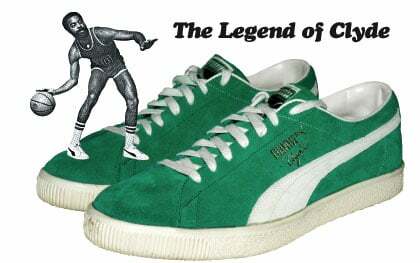 In 1968 the Puma Clyde released, which is a basketball shoe designed by Walter “Clyde” Frazier, which today is one of the more popular Puma’s. Over the years, Puma has taken their models to the next level. In 1991 Puma designed what is called a disc system. The Puma did not have any laces, but a adjustable fit. In 1996 Puma released the “Cell” which it is said to be the first foam free midsole. From then on, Puma has incorporated them into new models. Some collaborations Puma has done with MTV, which released recently. Two color ways were made of the Puma Clyde’s, the Pink Yo MTV Raps were available to the public but limited. A green color way was also made, but were limited and hard to get your hands on. Also Puma and Evisu hooked up to design the Puma Basket. This shoe featured the famous Evisu red logo at the heel. 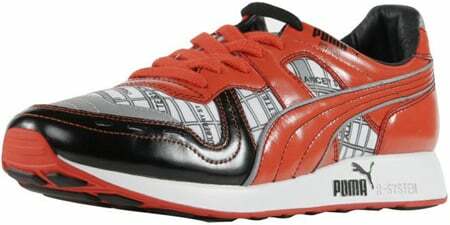 New models continue to release from Puma, but sneakerheads all around enjoy the Originals, or shall I say classics.